Welcome to TickPick’s Doak Campbell Stadium Seating Chart. Here we will cover everything you need to know before purchasing Cheap FSU Seminoles Football Tickets, including seat views, student sections, parking, and more. Doak Campbell Stadium, home to the Florida State Seminoles, is located in Tallahassee, Florida. The “Doak”, named after longtime FSU President Doak Campbell, was completed on October 7th, 1950. After almost seven decades worth of stadium expansions and renovations, the Doak went from originally holding 15,000 fans to now upwards of 80,000. All sections at the Doak follow a standard 1-41 sequence. The only exception is in the Champions Club where sections are tiered by 100 level, 200 level, and 300 level. The vast majority of seats at the stadium are bleacher seating, meaning no chair backs. The only sections that do have chair backs are in the Champions Club section in the South End zone. More on that below. The Florida State student section spreads across the North End Zone and East sideline in sections 40-41 and 1-7. Student tickets sell out quickly since only 16,000 are allotted across all FSU campuses. More importantly, you won’t be able to purchase student section tickets on the secondary market as only currently enrolled FSU students are eligible for these seats. Student tickets are also non-transferable. The club level seats at the Doak are located in sections 214-228 and 315-327, just above the FSU Marching Chiefs. Better known as the Champions Club, these sections include chair backs, food and beverage, cash bars, Wifi, and access to more than 70,000 sq ft of air-conditioned clubs and covered rooftop terraces. Sections 13-16 and 117-118 are the designated visiting team sections at the Doak. Be aware that the visiting team rows are 50 to 86 in sections 13-16. If you are fan of the opposing team and want to sit ensure you sit with your fellow fans, this is where you want to be. If you are a FSU fan, make sure you avoid these sections! 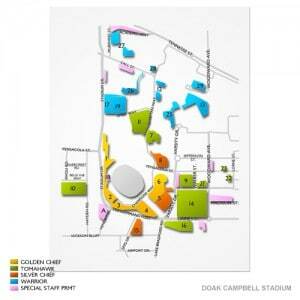 This is a detailed map of the designated parking areas near the Doak. Most lots directly surrounding the stadium are designated Seminole Booster lots and require a parking permit. If you do not have a parking pass please refer to any lots that are listed as general parking. There are several lots on campus and side streets that are available for general public parking as well as parking available at the Civic Center and surrounding state parking garages. As cliche as it is, there really isn’t a bad seat at Doak Campbell Stadium for an FSU football game. You can feel the energy of the crowd from all corners of the stadium. But, like any football stadium, the best viewing will come in the sections between the 30 yard lines. Personally, I prefer sitting near the student section near section 8. There is a contagious energy that spreads from the students to every surrounding section. It makes for a unique game day experience. Remember, TickPick does not charge service fees, so if you haven’t secured tickets yet check out our Cheap Florida State Tickets!